Oleg Sydyak is Managing Director, Head of Asset and Liability Strategy at PNC Capital Advisors where he serves as the chief actuarial officer for the firm. Sydyak is responsible for the development of Liability Driven Investing strategies, including analysis of the capital market assumptions, performing assets and liability studies and cash flow modeling, and making asset allocation recommendations. 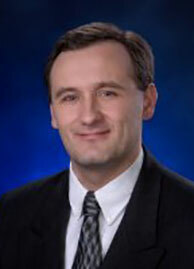 Prior to joining PNC in 2011, Sydyak was a manager and consulting actuary with PricewaterhouseCoopers. He also held actuarial consulting positions with Tower Watson and Buck Consultants. Sydyak co-teaches Fixed Income Investments: Corporate and Sovereign Bonds with Pietro Veronesi and is also a contributing author of the Handbook of Fixed-Income Securities which was edited by Veronesi. Sydyak received a bachelor’s degree in applied mathematics from Kharkov State Technical University of Radio-Electronics, an M.B.A. degree in analytic finance and accounting from the University of Chicago, and a master’s degree in political economy from the London School of Economics and Political Science. He is a CFA Charterholder and holds Fellow of the Society of Actuaries and Enrolled Actuary designations.